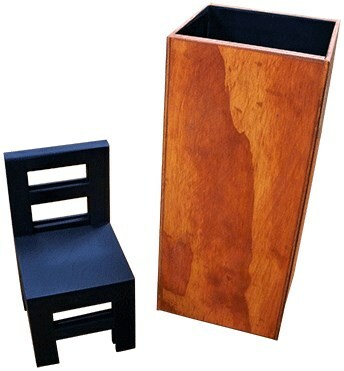 The magician displays a miniature chair and places the chair into a square tube. The performer then removes the chair and turns it upside down and places it back into the tube. He/she then raises the tube and the chair is now right side up. Upon reaching back into the tube, he/she then pulls out the chair and it is again upside down. Tube Dimensions Approximately: 14" x 6" x 6"
Mini Chair Dimensions Approximately: 8" x 4.5" x 4.5"